When I think of a mens dinner jacket, there are two words that come to mind. Style and Sophistication. Tazio brand dinner jackets are made with only quality fabrics and use only the best tailoring techniques for their dinner style jackets to give you the look and fit you that will make you stand out from the crowd. 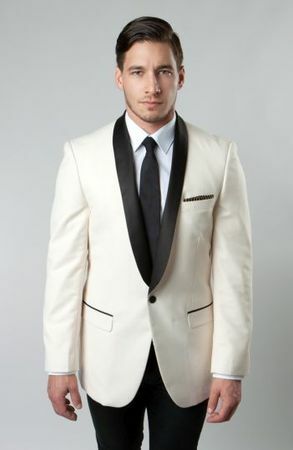 This ivory and black dinner jacket is made of shiny sharkskin fabric and has a beautiful french faced lining. Slim Fit.